Assistant Grade I- Passed Graduation Degree in Any Stream from any Recognized University. Assistant Grade II- Passed Intermediate Exam with Hindi/English Stenography Or Diploma in Computer Application or Equivalent. 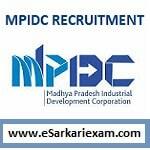 Eligible Candidates can Submit MPIDC Assistant Grade 1/ 2 2019 Online Application at the Official Website of MP Online Latest by 6th April 2019. Open Assistant Grade 1/ Grade 2 Advertisement Link. Click on Assistant Grade 1/ Grade 2 Application form Link.